gallery onetwentyeight is pleased to present Night Flight, an exhibition of works by Japanese sculptor Hiromitsu Morimoto, featuring plastic and wooden sculptures made between the 1990s through 2015, his first presentation in New York. From 1973 to 1999, Morimoto fulfilled himself as a professor in the Department of Art at Tokyo Zokei University, Japan. After retiring from teaching, he pursued his creation of beauty; developing his own method and unique shapes of acrylic acid resin, finally scheduled to present a series of seven-foot high molds for bronze sculpture. Morimoto, however, passed away in June 2015, just before the opening of his exhibition held in Ginza, Tokyo. The result is that his son, Yuchi Morimoto, now has the realization of showing Hiromitsu’s work to the people of New York. Shigeyuki Imai, a stage performer and composer, comments in the foreword to the Morimoto’s 1999 exhibition booklet that while the subliminal source of his creation is based on Eastern sensitivity in nature, his thinking process may be found in the Western aesthetics of Michelangelo’s Renaissance. He gradually assimilates himself into the transition that can be seen in the Western contemporary art. By repetition of trial and error, Morimoto develops his unique three-dimensional silhouette, which is the fruit of learning European mythology and literature. Complexity of references is then transformed into a sort of symbolism, aesthetics of which finally gets embodied in his sculptures. Provoked by Western culture, Morimoto’s unconsciousness cultivated in the East reaches unique shapes of the Western goddesses with unrealistic angles focusing on the region of the forehead and nose. The huge sculptures of acrylic acid resin with mysterious brass eyes attract the viewer, and even people across the street, showing ceremonial and esoteric aspects of the spiritual world. Among the seven-foot high sculptures is “Night Flight”(2000-15) on which Morimoto renders fleeting feeling, fear of death in darkness that he experienced while looking out the window of a night flight on his way to Africa. 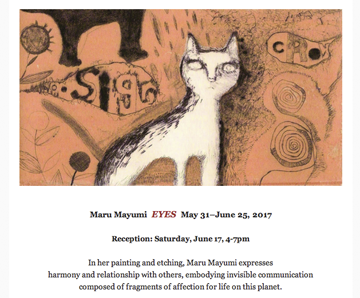 In her painting and etching, Maru Mayumi expresses harmony and relationship with others, embodying invisible communication composed of fragments of affection for life on this planet.